JACK PEARCE says he would have resigned as Bognor manager if their results were down to a lack of effort by the players. 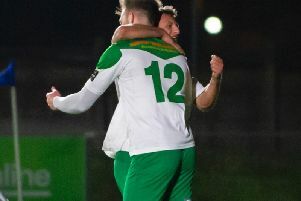 The Rocks have struggled for wins for months and go into Saturday’s home game against Truro six points from safety in National League South. After months of trying, they’ve finally landed a striker – Iceland under-19 international Stefan Ljubicic has joined on loan from Brighton and should go straight into the starting XI. Pearce said: ‘If one of the reasons we were getting beaten was a lack of effort, I wouldn’t be sat here as manager. ‘I’d have gone weeks ago. ‘The players are giving it, and giving me, absolutely everything. ‘Where I have failed is in getting in a striker and a goalscoring midfielder. ‘But we’re delighted to sign Stefan and hope he’ll be a success. ‘We hope it will work out well for us. ‘We must have been through 15 or 20 possibilities in terms of getting a new striker in. Most of them don’t want to come and play for us. Ljubicic, a 6ft 4in tall 18-year-old, is on loan, provisionally until the end of the season, from Brighton’s academy. Fans will hope he is finally the answer to a season-long hunt for someone who can score regularly. Ibra Sekajja and Jimmy Muitt have been battling away up front without much luck – after Jimmy Wild left through lack of first-team opportunities and Ollie Pearce was ruled out by a fairly long-term groin injury. Loan strikers Chinedu McKenzie and Ferdinand Takyi were given chances but were not the answer. Ljubicic has played 14 times for Iceland’s under-18 and under-19 teams, scoring seven goals, and he is the Rocks’ second signing in a week. Winger Anthony Nelson, 20, from the Cayman Islands, has been training with the squad and has signed, but he is not yet ready to debut.